Now, I’m not a betting man, but I think if I told you there was a cart that served sushi, you might take a minute to think about that. You might think about cost of refrigeration of fish, freshness, the movie “The Blob”, or something like that. 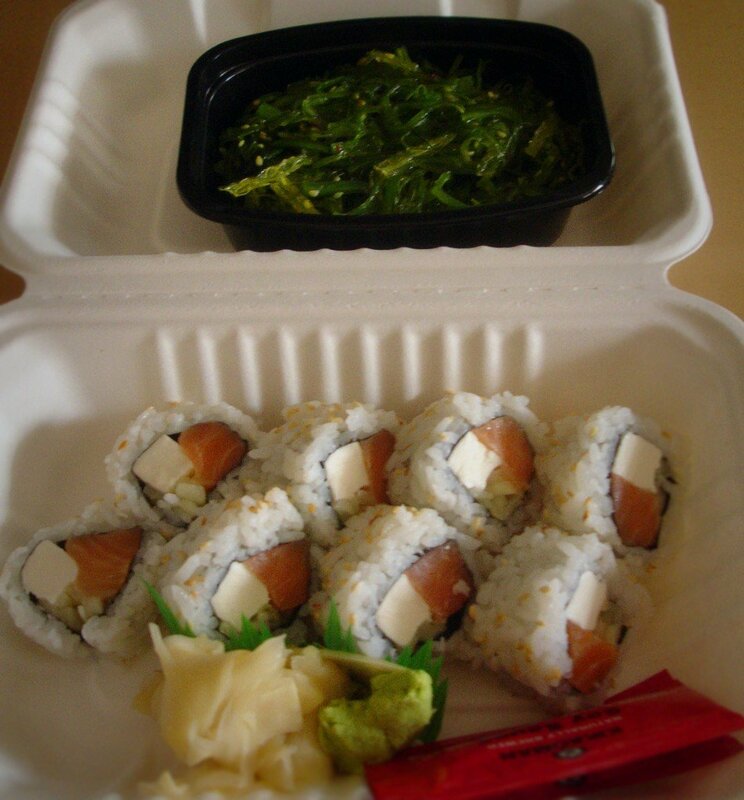 Today I went over to Toshi’s cart “Sushi PDX” and had a Philly roll with a seaweed salad. This was a great meal. The last time I had seaweed salad that tasty was in Pittsburgh at Sushi Kim. Man, I miss that place. The ginger was really yummy and the fish was perfect. I watched Toshi make it as we joked about this and that. The roll was $6.50 and the salad was $3.50. I’d give this 8/10 finger-lickin’s…but…I have some sad news. Apparently Green Castle Food Court will be shutting its empire down next week. All the carts are moving. Sushi PDX is moving to Good Food Here food carts on 43rd and Belmont to live by my sweet chicken lover Cackalacks. I don’t know where the other carts are moving to, but I’m very sad for two reasons. Reason number one is that I won’t be able to roll out of bed and go get amazing food across the street from me. Reason number two is that the antagonist of this event is somebody is just bored and decided that they needed to shut down about a dozen or so people; displacing them out of their work space. I hope they like the homeless mattress forts and piles of human excrement that will surely come back into the lot once it is vacant again. Good work. Alright. I’m done ranting. I’ve got work to do. Talk to you later people.